The polyphagous tropical Mediterranean fruit fly (Ceratitis capitata Weid. (medfly)) was detected in California in 1975, and a large-scale detection/eradication campaign was begun in the absence of sound knowledge of the fly’s potential invasiveness and geographic distribution. Persistent measurable populations of the fly have not been found in California, but a scientific explanation for this has not been developed. A physiologically-based demographic system model (CASAS) was developed to examine the effects of temperature on medfly’s potential distribution across the ecological zones of Arizona-California (AZ-CA), and in Italy where the fly is established. The system model simulates the daily age-mass structured dynamics of a tree host composed of sub-unit populations of leaves, stem, roots and fruit, as well as the age-structured dynamics of medfly life stages. Total pupae tree-1y-1 was used as a metric of favorability for medfly at 151 locations in AZ-CA during 1995-2006, and at 84 locations in Italy during 1999-2005. The results were mapped using GRASS GIS. AZ and the southern desert areas of CA are unfavorable for medfly because of high summer temperatures, while much of CA, including many frost-free areas, is too cold. Only the area in south near-coastal CA (San Diego, Orange and Los Angeles Counties) is potentially favorable for medfly, but in the absence of measurable populations, but we cannot say whether it is established there. The majority of medfly discoveries over the past 35 years have occurred in this area. Discoveries also occurred in northern CA, and most occurred during 1975 and 1980-1981 in an area generally unfavorable for medfly (i.e., Santa Clara County just south of San Francisco Bay). We note, however, that temperatures during 1979-1981 in Santa Clara County were marginally favorable for medfly. New discoveries of the fly in the unfavorable areas continue, and are likely new introductions. In contrast, medfly has been established in Italy for decades, and our model predicts a wide distribution in the southern and western regions of the country. The fly is restricted in northern areas and at higher elevations of Italy by winter temperatures. Gutierrez, Andrew Paul and Luigi Ponti (2011). 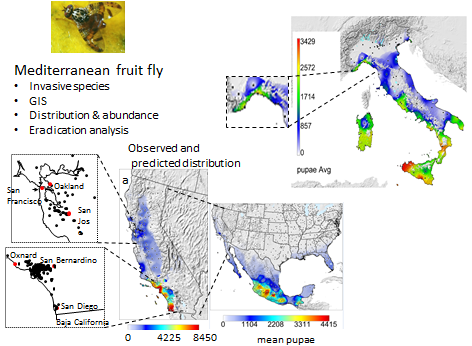 Assessing the invasive potential of the Mediterranean fruit fly in California and Italy. Biol. Invasion DOI 10.1007/s10530-011-9937.